From Akron, Ohio we now have the story of a first-grader who stepped on a used syringe. It happened in her school when she was emptying the trash for her teacher. So, what was the little girl doing barefoot at school? Last week was full of nice days, so I finally got out to do a nice barefoot bushwhacking hike at Cantwell Cliffs. I spent some time exploring again in the Henley Hollow area north of the main park area. That’s a lot easier when the leaves aren’t on the trees yet. Our comic this weekend comes from the New Yorker and is dated June 23, 1997. 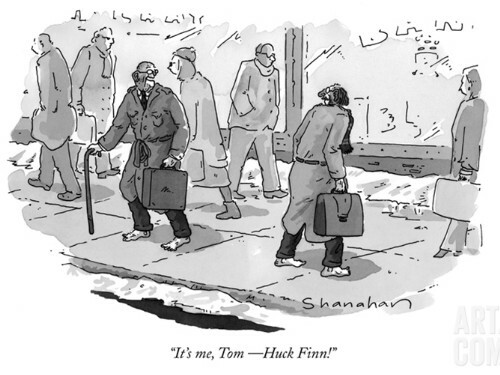 The artist is well-know New Yorker cartoonist Danny Shanahan. The story is about two Moms who started their own business serving a need. The main story is how they built their business. But it is what their business is for . . . The new season of Dual Survival with barefooter extraordinaire Cody Lundin and super-military Joe Teti returns tonight.